Lilian Kluivers is a Shiatsu practitioner based near Amsterdam who has published a general book on Do in and is now working on one specifically for pregnancy. She is kindly sharing some of her exercises for my Blog. Pregnancy can be a very beautiful and almost magical period in which your body changes daily to create a warm temple for your developing baby. This takes an enormous amount of energy. Besides eating healthily and taking enough rest, certain exercises can help to strengthen your – and therefore your baby’s – energy. This article will provide a short series of exercises especially selected for pregnant women. You can practice them on a daily basis (this will take about 15 minutes) or at least once a week. These exercises originate from Do-In, an art of movement which is part of the Chinese medicine. They promote circulation, relaxation and breathing space. Especially the breathing exercises can be of great help in the last trimester and during labor. Not only because deep and calm breathing eases the mind; it can also prevent or diminish backaches. After practicing this short series you’ll feel a lively feeling of circulation in the tips of your fingers and toes, and a greater body awareness. Enjoy! Take a sitting posture, for example on a chair or a meditation cushion. Place both hands below your navel center. Bring all your attention to the breathing; breathe five times very calm and through your nose. First focus on the movement in your lower belly, diaphragm and chest. The next five breaths focus on the lower back, then the upper back subsequently the waist and finally the torso as a whole. Effect: This exercise helps to use the whole capacity of the lungs. 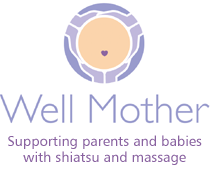 This eases the mind and provides you and your baby with an optimal amount of oxygen. Bring your chin to your chest and turn your head slowly to the side, until your right ear is above your right shoulder. Turn back with your chin to you chest and on to the left side. Repeat five times. Effect: This exercise helps to relax the muscles in you neck and shoulders. This has a great effect on the muscles of the perineum. Lift both shoulders up towards your ears, circle them forward and down. Circle your shoulders in this way five times forward and five times backwards. Effect: This exercise releases tension from the shoulders, which are often very tight. Also during the delivery they can be very tense. Learning beforehand to relax this area can be of great help later on. Interlace your fingers . Circle your wrists, both to the front and to the back. Then shake your hands as if you shake water drops of them. Effect: By improving circulation the chance of water retention diminishes. Take a standing posture: feet hip distance apart, toes pointing forward. Make a long spine and relax your shoulders. Massage the edges of your feet to the floor in a circling motion. Effect: By improving circulation in your feet and ankles you prevent water retention. This exercise will help to calm down in the evening and feel awake in the morning. Place your hands on your hips and start circling them. After a few times also circle the other way around. Effect: This motion stimulates circulation from the legs through the hips. During the contractions this exercise – like all other pelvic movements – helps the baby on its journey downwards. Start swinging from the center of your body (the lower belly) to the left and right. Feet and knees stay still. Arms are completely relaxed; in this way the hand softly taps on the back (kidney area) at the end of each swing. Move ten times left and right. Then close your eyes and feel the effect of this first few exercises. Effect: The swinging relaxes the muscles in the spine. The tapping on the kidneys gives extra energy to you and your baby. With loose fists and wrists tap all over your body. Start with your head and neck. Then tap your arms: the most effective is tapping on the inside (the soft part) of the arm from the armpit towards the fingers. And on the outside of your arm from the fingers back up to the shoulders. First one arm, then the other. Then start tapping on the lower back. On the legs we tap – just like the arms – in the direction of the energy flow. Start on the thigh. Tap downwards in a line outside the knee towards the foot. Then move up again on the inside of the shin an knee. Next move down again on the outside of your leg: if you’re wearing a pants this energy path is about where the stitches at the side of your pants are. Then back up on the inside of your leg – again alongside the stitches. Finally tap down the back of your leg and back up on the inside of your leg, this time just behind the stitches of your pants. The last few weeks of your pregnancy it will probably be a bit difficult to tap on your lower legs. In that case just tap on the upper legs. Take a sitting posture. Warm your hands together and then place your palms on your belly. Start stroking circles clockwise on your belly. Repeat at least three minutes. Effect: This rubbing helps to get in touch with your baby. The baby is very sensitive and will feel the warmth of your hands. Some midwives even feel this exercise helps to balance the amount of amniotic fluid. Lilian Kluivers is a Do-In teacher and teacher trainer in the Netherlands. Her first book (unfortunately not yet available in English) is about Do-In in general. She now works on a book about Do-In during pregnancy.